Here, finally assembled together in one collection, are Bert Montgomery’s LGBTQ-related musings, columns, and sermons. Bert uses humor, stories, and the Holy Scriptures to challenge the heresy of homophobia within the church and to call for full inclusion and affirmation—in both church and civic life—of our LGBTQ family members, friends, and neighbors. And yes, a rabbi and a preacher really did go to a Pride parade! Bert Montgomery lives in Starkville, Mississippi, cheers for the Mississippi State Bulldogs, writes, teaches, and is even called “pastor” by a few hearty souls. His previous books include Going Back to New Orleans, Psychic Pancakes & Communion Pizza, and Elvis, Willie, Jesus & Me. With creative humor and reflection, A Rabbi & a Preacher Go to a Pride Parade offers provocative and prophetic perspective on matters pertaining to Christian faith and human sexuality. Sometimes we make love sound so complicated, when it’s all pretty simple. Hold a hand, walk in a parade, or just simply say “I want to be your friend.” Personable and sincere, Bert shares his heart for making every person in Starkville, Mississippi, his truly cherished neighbor. His writings remind me that the Christian experience isn’t about building up a fence of protection, but rather daring to allow love to lead us out of hiding and into the light of a brilliant life. With ribald wit and perceptive understanding of the complications of being human, Rev. Bert Montgomery has offered an expansive view of God’s welcome. This collection of sermons, which bears witness to prophetic advocacy of LGBTQ persons, offers a discerning approach to the practice of inclusion. I commend its normalization of sexual minorities, especially within faith communities. 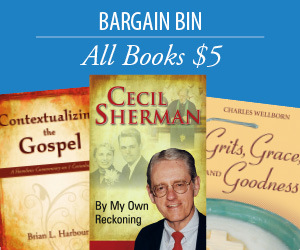 This breezy, down-on-the-ground, readable book is made for personal perusal or Sunday school classes and other study groups who want stimulating pieces to get them going. Bert has that disarming way of opening up the LGBTQ+ issue and whacking you up against the head with some powerful biblical challenge you had not anticipated. What is unstated in the book is the kind of courage it takes to be Bert Montgomery in Mississippi and the integrity of witness he has now sustained there for a decade. Enjoy his humor but do not let it obscure the faithfulness and commitment he has embodied in his life and ministry. 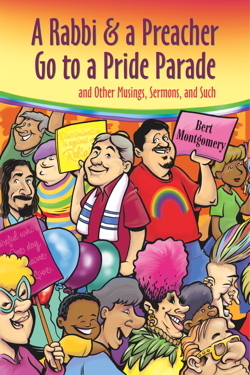 Employing thoughtful intelligence, spasmic wit, and the Healer’s wholistic approach to Scriptures, Pastor Bert Montgomery issues a clarion call to Christians the nation over to live out the “wildly inclusive love of Jesus.” A Rabbi & a Preacher Go to a Pride Parade may sound like a joke, but Montgomery isn’t fooling around when he notes that in most churches in America, the LGBTQ community is not welcome. Taking up the admonition that he is to be an advocate for those living in the margins, Pastor Bert boldly challenges his own community of Starkville, Mississippi, to model the love they wish to see in the world. When the residents of Starkville rise to the challenge, Pastor Bert is the least surprised of all. He knows the transformative love of Jesus can change the most bigoted of hearts. If it’s inspiration and understanding you seek, read this book.